Without going so far as the complete separation suggested in this scheme, there is no doubt that the whole tendency of modern life is, for the poor as for the rich, towards an alienation of the children from their parents - Sunday schools, games clubs, free meals, even the "happy evenings for the little ones," what excellent schemes they all are! Yet I confess that full of admiration as I am for each individually, as a whole, I dread their results. 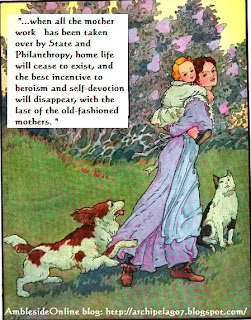 Nature is a stern economist, and unused powers soon atrophy, and when all the mother work has been taken over by State and Philanthropy, home life will cease to exist, and the best incentive to heroism and self-devotion will disappear, with the last of the old-fashioned mothers. But the question especially before us in this paper- the question that I am earnestly hoping some other parents will help me to answer, is what ought we mothers of the middle and upper classes to do in this matter? Are we to give up the management of our children altogether to experts in each phase of child life, or are we to "face the music" of professional criticism and insist on doing a certain amount ourselves? Personally, I do not think there can be any complete or definite answer to this question. Each mother must decide for herself, what she can and will do for her children, for it is not every woman who can nurse a sick child, or teach a wilful one. Two things only I venture to plead for. Let us keep some definite share in our children's lives- if we cannot teach them, or nurse them, then at least let us play with them, or work with them, but at any rate, have a real personal share in the young lives, somehow, so that we may not become to our children the mere payers of bills, and adorners of childish garments. The other definite duty that I should like to urge is that the mother, what ever else she gives up, should at least keep in her own hands the first religious instruction of her children, surely, the God who has knit together with such amazing closeness the lives of child and mother must have intended the first knowledge of Himself to come from her. No two human beings think of God quite in the same fashion, but by teaching the little ones ourselves we can at least make sure that the first image help up to the childish mind is the noblest and most beautiful we ourselves can conceive. In this case it is really no excuse to say, "I am no good at teaching." No one need be a professor of theology or a trained instructor to impress upon a child's mind the one great fundamental truth that underlies all true religion- that in all that He says and does and is- God is Love; so that our little ones "being rooted and grounded in love, may be able to comprehend, with all the saints what is the breadth, and length and depths and height- and to know the love of Christ which passeth knowledge." This one lesson, so simple that the babies can understand it (sometimes they seem to understand it better than their elders) so deep and complicated in connection with the mysteries of sin and suffering and death, that even the wisest of our clever sons can never fully grasp it, this we must face boldly with our children or neglect the greatest opportunity that God has given us; for when a boy learns from his mother's lips, with all her soul's tenderness in voice and eyes, that her love is but a shadow dim and imperfect of the love of God, then he gains an impression of God's love that in beyond all words, and that no one else on earth can ever give to him. Our source for this article: Previously, I shared how the Advisory obtained the Parent's Review volumes which our volunteers have typed for Leslie to put on the website. Shortly after that blog-post, our volunteers finished typing up the last of the 9 volumes that were in the Advisory's possession. Providentially, we believe, at that same time one of our AO users shared that another volume was available for sale in England at a charity website. It was shockingly underpriced (I think about ten pounds), so I scurried over there and bought it. (I really love the internet, don't you?) It's volume 19, published in 1908. You can see the table of contents listed here on our website. We'll be posting more photographed pages to share for volunteers to type as soon as I can coerce, er, I mean, cajole and convince, my 17 year old to photograph it for us. Her 23 year old sister did the photographing of volume 2 for us and she does physically still live at home, however, she is currently absorbed in college work and wedding plans. The 17 year old is lobbying for a reduced school schedule in exchange for photography work. (Updated: we had come to an amicable arrangement, and then ran into camera problems, and we are now awaiting a new charger). In the meantime, I thought I'd share an article that I enjoyed here on the Advisory Blog. I'll be posting it in installments. I hope you enjoy it as much as I! Yes, please can we have the final instalment? Just realized their was a blog. It's in my side bar now! Difficulties of Modern Motherhood, cont.